As you may already know, when I want something I don't stop searching until I find the perfect one. 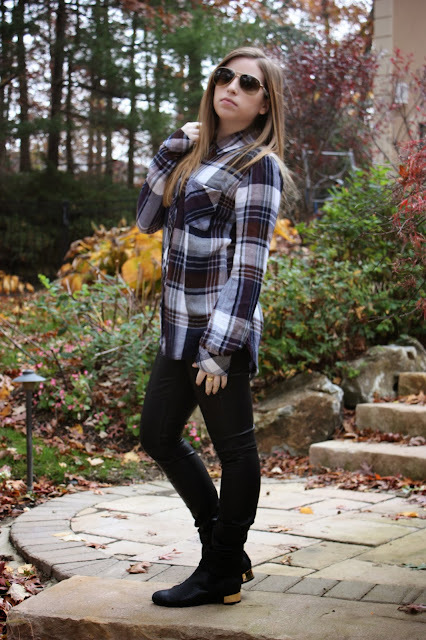 Like with my leather pants, or my moto boots, and this plaid shirt. You think it would be easy considering how much plaid I've amassed this fall, but then again I'm very picky. But with this shirt it was love at first sight, and feel. Seriously this is the comfiest shirt ever. In fact, I'm actually wearing it right now (which will be yesterday when this is posted). In the photos I wore the shirt with my leather pants to edge it up a bit. But in real life I'm wearing this shirt with leggings and I couldn't be happier, or comfier.